I hate football. I may even go as far as saying I loathe it. I personally blame my Dad for this who watches it every Sunday night when I choose to have dinner. Even I can’t crunch over the droning sound of the TV. I still can’t get the obsession with people who are essentially kicking one ball from one side to the other, such madness, eh? But as society dictates, if you have a boyfriend or girlfriend the likelihood is that they’ll either love football or rugby. So I thought maybe it was time I stopped battling football and actually gave watching a real life game a proper chance. So on Saturday I got the tube to Seven Sisters and was sucked into the stadium of White Hart Lane, I didn’t know what to expect but I’m one for trying new things this year so went in with an open mind. 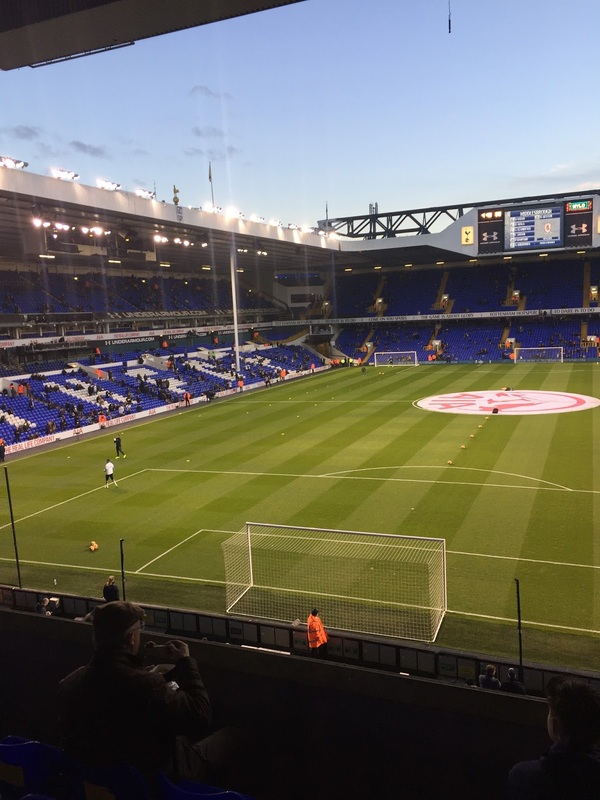 It’s fair to say that these 12 thoughts at my first premiership football match were obvious. #1. A football ground is the only place in the whole existence of the earth where roles are reversed. PUBLIC SERVICE ANNOUNCEMENT: You DON’T have to queue to use the toilet, and there’s loads of them, what sweet hell is this? #2. EVERY spectator is basically the football manager for said club. “PASS IT” “SHOOT” “He’s done nothing this match” “Shouldn’t be on £100k a week for that performance”, etc. #3. No sentence uttered within the stadium can be constructed without a swear word. Won’t work. #4. When everyone sits forward this means ‘a goal could happen’, head in hands – not so good, and.. repeat. #5. You feel like a sardine crammed into a tin in your seat. They’ll be at least 5 occasions that your neighbour almost takes your eye out with their elbow too. #6. You may feel like a rabbit in headlights as there is SO many people, so many men. It’s like a secret club that no one talks about, and should I really be here? #7. People treat the snack situation like the cinema. Eating sweets and munching on hot dogs between goals is a REAL thing, and I like it. #8. This is not the place for high heels and skimpy outfits. Not being able to feel your feet and hands after an hour is common practice. But I’m not ready to surrender to the sweaty, nylon football top trend just yet. #9. You’re completely mesmerised by the ‘boxes’. What celebs are sat in there? What are they talking about? And WHY IS MY BF NOT A PREMIERSHIP FOOTBALLER? #10. Watching football in the flesh is like watching an amateur game of year 10’s playing football. How can it be so different? #11. The fans clap at everything. Pass the ball to a team mate? Clap. Stop the ball from going offside? Clap. Happy to just be there? Clap. Prem footballer looking great in those under amour trousers? Yes, I’ll bloody clap at that.